A manual task execution allows you to invoke a task directly with an immediate effect, without defining and triggering an event. There are a number of task types that are usually associated with a triggering event, such as a file listener or a graph/jobflow listener. You can execute any of these tasks manually. 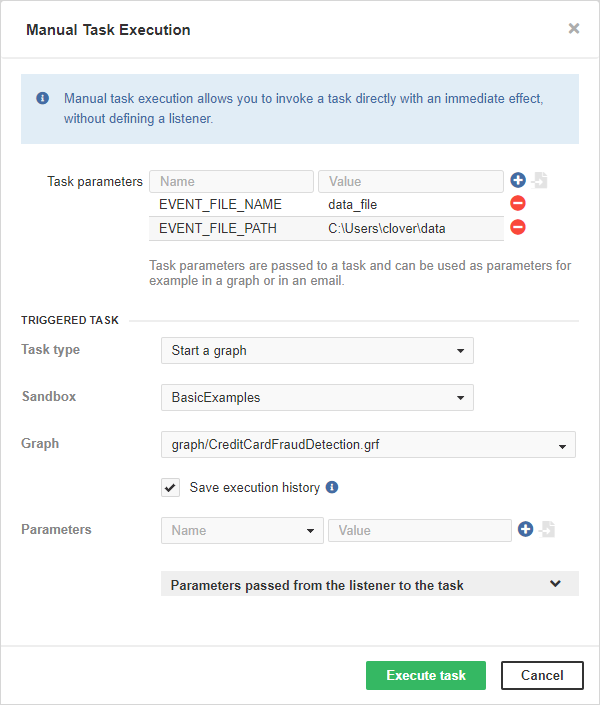 Additionally, you can specify task parameters to simulate a source event that would normally trigger the task. The following is a figure displaying how a 'file event' could be simulated. The parameters for various event sources are listed in the Chapter 27, Graph/Jobflow Parameters. In the Server GUI, switch to the Event Listeners tab. In the New Listener drop-down menu, select the Manual Task Execution option. To access the Manual Task Execution form, you need Manual task execution permission.